Virginia Grohl, mother of Dave Grohl, had not seen any of it coming. Not the arenas of screaming fans, not Nirvana or the Foo Fighters, not the induction into the Rock and Roll Hall of Fame, and certainly not her son, Dave, performing with Sir Paul McCartney at The White House. Theirs had always been a life full of music - the Grohl family sang together on long car trips, harmonising to Motown and David Bowie - yet Virginia never expected her son to become a musician. But when Virginia saw Nirvana play for the first time to crazed applause from thousands of screaming fans, she knew nothing would ever be the same. She was the mother of a rock star. And as Virginia watched her son's star rise, she often wondered about the other mothers who raised sons and daughters who became rock stars. Were they as surprised as she was about their children's fame? Virginia often wondered about the mystical force that urges some of us to listen, to play, to surround ourselves with music. She wanted to talk about it with the other mothers whose sons and daughters were sharing stages with Dave, and she decided to seek them out wherever they were. So began a two-year odyssey, where she had conversations with such women from all over the world as Verna Griffin, Dr Dre's mother, Carolyn Williams, Pharell William's mother, Janis Winehouse, Amy Winehouse's mother, Patsy Noah, Adam Levine's mother, Donna Haim, mother to the Haim sisters and Hester Diamond, Mike D of The Beastie Boys' mother, to name just a few. From Cradle to Stage will appeal to mothers everywhere, but particularly to those with children who march (or play) to the beat of their own drum; and it's for those children who have their mothers to thank for everything. For music lovers and rock fans, it's the ultimate backstage pass-for anyone who has wondered what it's like to be on the inside...looking out at a packed arena. 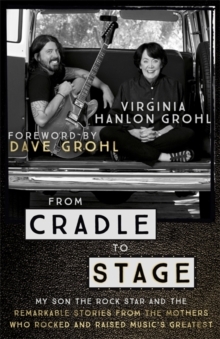 Featuring a foreword by Dave Grohl and exclusive family photographs, interviews are interwoven with the Grohl family story and the resultant book is a very intimate portrait of what makes a rock star.